Security screws are the ideal way to keep people from tampering with rack mounted equipment. 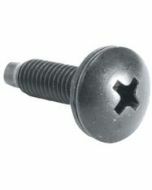 Screws are 10-32 by 3/4" and include factory-installed black nylon washer, black finish. 0.85" x 3.75" x 4"